I only found out about these guys quite recently, and pretty much by accident, but ever since then I’ve been trying to figure out a time and opportunity to check them out more closely. I finally got that chance on Wednesday afternoon, and I have to say – I am pretty thrilled with what I’ve seen so far! I’d entered a photo caption contest around the end of June/beginning of July on Facebook, and ended up winning two tickets to my choice of three presentations at three different locations. I hadn’t actually considered how I would get to any of them prior to winning, but we got it all worked out and it was with MUCH excitement that my friend and I made our way out to Vaughan for the show! The whole time, I was praying for a lemur to be a part of it, because they’ve been one of my favourite animals for a long time, and ever since my Jungle Cat World experience, I’m been dying to pet one again. So I watched closely as the Hands On Exotics folks arrived and started unloading crates of animals into the room where the presentation would take place. There was nothing that likely to be a lemur, unfortunately, but so many other cool critters that my disappointment was short-lived. We got in early enough to grab chairs in the back, rather than having to sit on the floor with the kids (who ranged in behaviours throughout most of the show), and settled in – with cameras – to enjoy what we were about to experience. And it really is an experience. 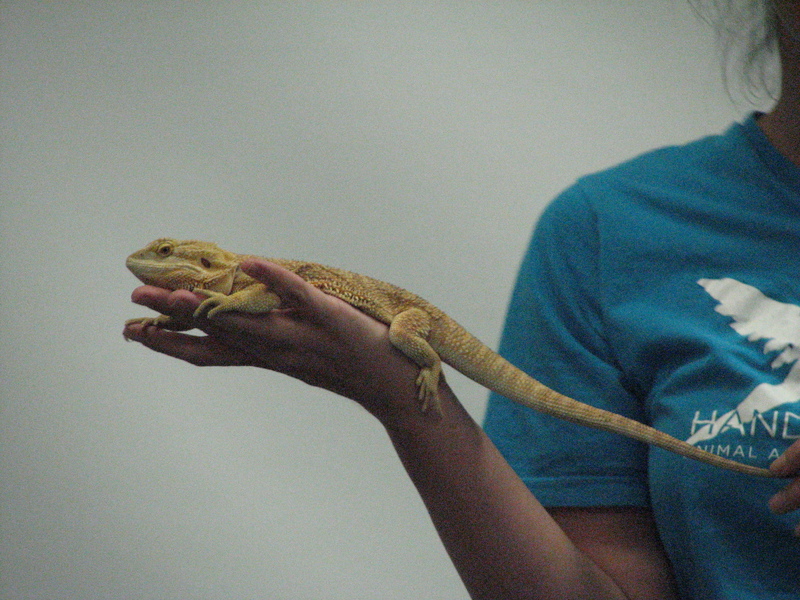 Hands On Exotics has a slew of different animals at their disposal, and the staff are all super friendly and incredibly knowledgeable. They not only know important information about a variety of species, but they also know their particular animal personalities very very well. From who doesn’t want to be touched to who would prefer to be sleeping, the audience was given a wealth of information to carry away with them at the end of the 2 hour presentation. 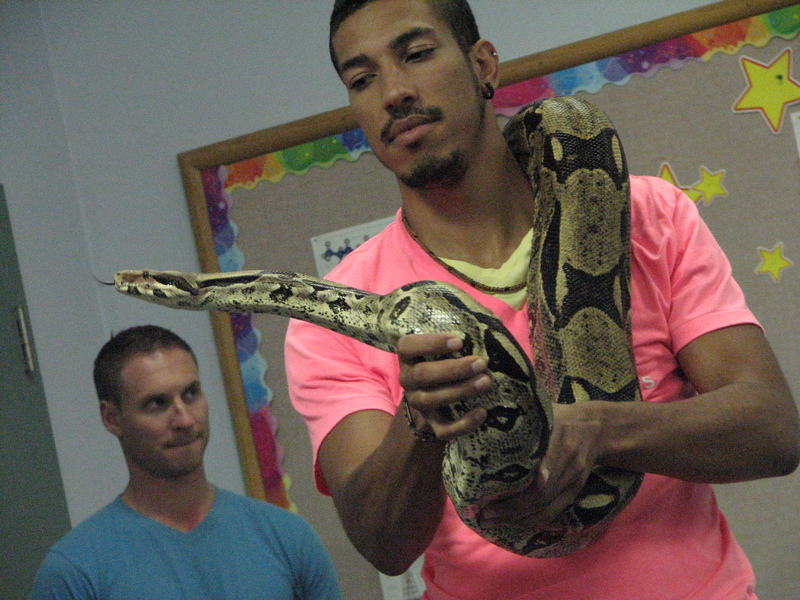 On top of that, everyone was given the opportunity to take pictures of and pose with all of the animals on hand. 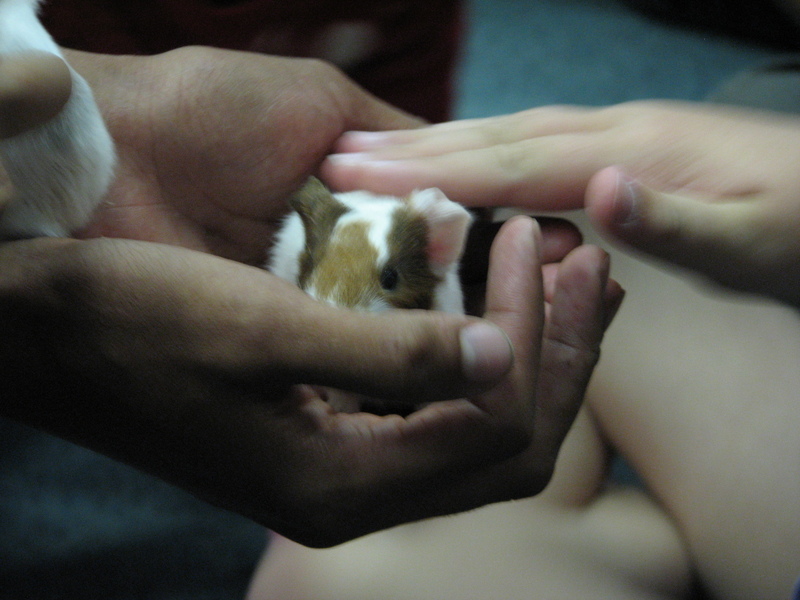 In most cases we were instructed on the proper way to pet and interact with them, as well, which is very important when getting to know any animal, regardless of its species. I had emotionally prepared myself to touch or hold the tarantula if given the chance – even though the very thought of sharing the room with it terrifed me – but instead Seth carried it around the room and CLOSE to us, rather than handing it over for people to hold. So I was saved there, while still getting much closer to one than I have before. And learning a lot more about them, to boot, so that will help for next time maybe! 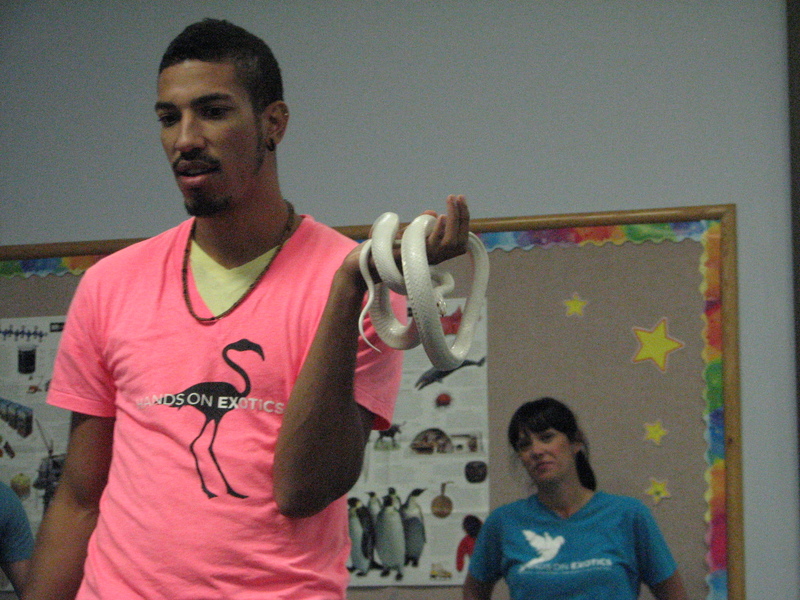 Our presenters were Seth (co-owner), Michelle and Kevin and, after explaining a few basic rules of conduct, they started bringing out the animals for us to experience. There was a mama guinea pig and her adorable little newborns, which were way bigger than I’d have expected. Good job, mama! 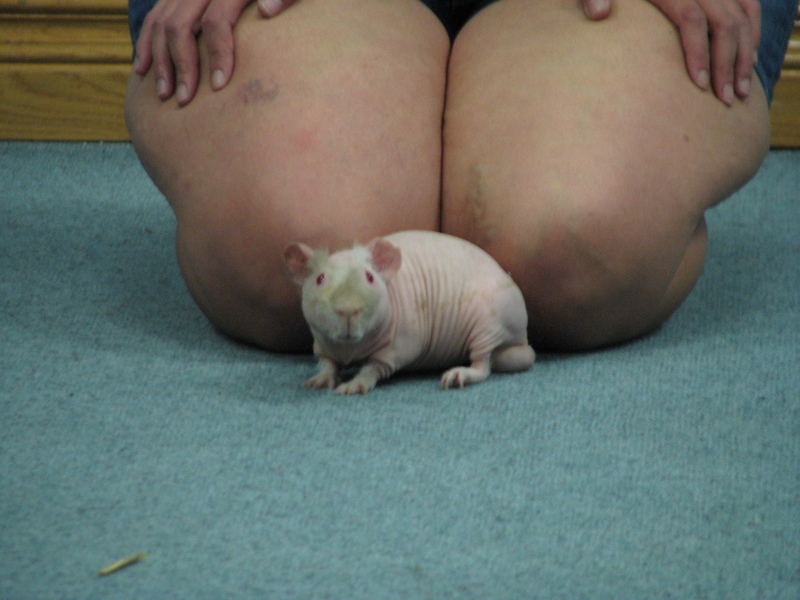 There was a skinny pig, who was the first of two albino critters we’d be introduced to that day. There were some cute but grumpy-and-vocal-about-it Sugar Gliders that I wish I could keep in my pocket forever and ever. 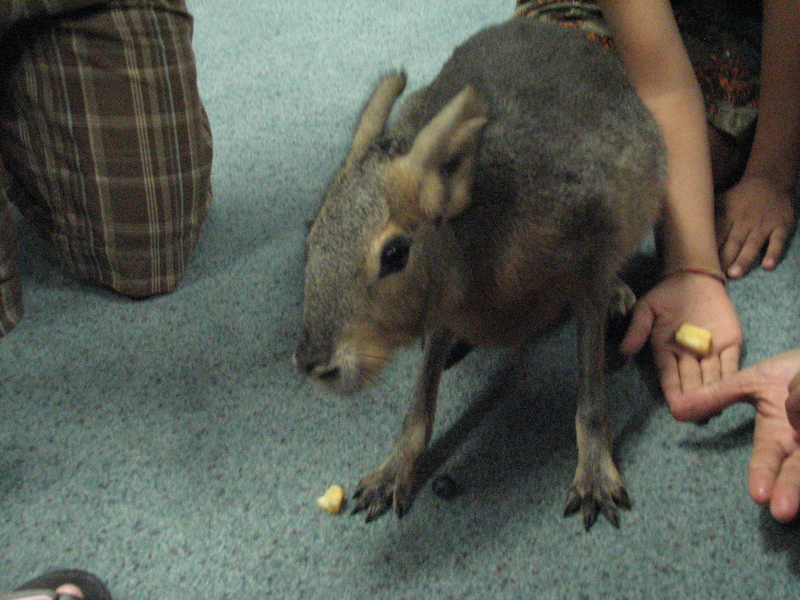 There was a Patagonian Cavy – a distant relative of the guinea pig that actually looks like a cross between a bunny, a deer and a kangaroo. I should have worn my platypus shirt that day in solidarity, perhaps! 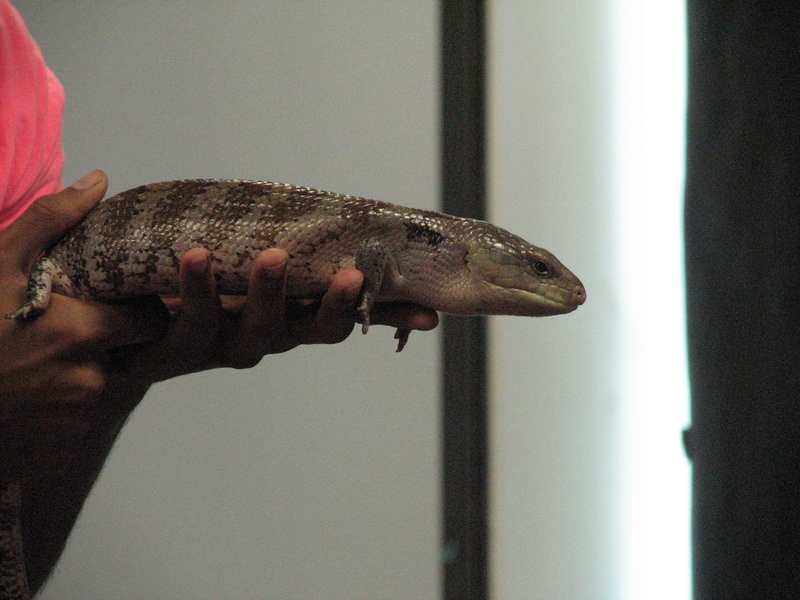 We met a bearded dragon named Hotdog, a blue-tongued skink named Geronimo and a pretty big (yet still growing) boa constrictor named Henry. 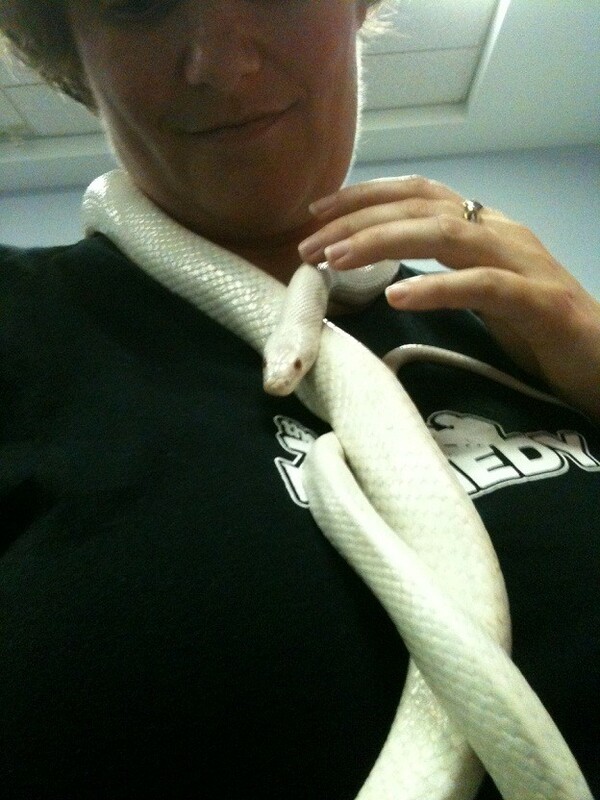 The second albino came in the form of a corn snake, which I got to wear around my neck and pet and for my first up-close snake, it was pretty darn cool. Both cold-blooded cool, and neat cool. So very smooth and shiny! The tarantula went by and I’m still alive, so that’s something. 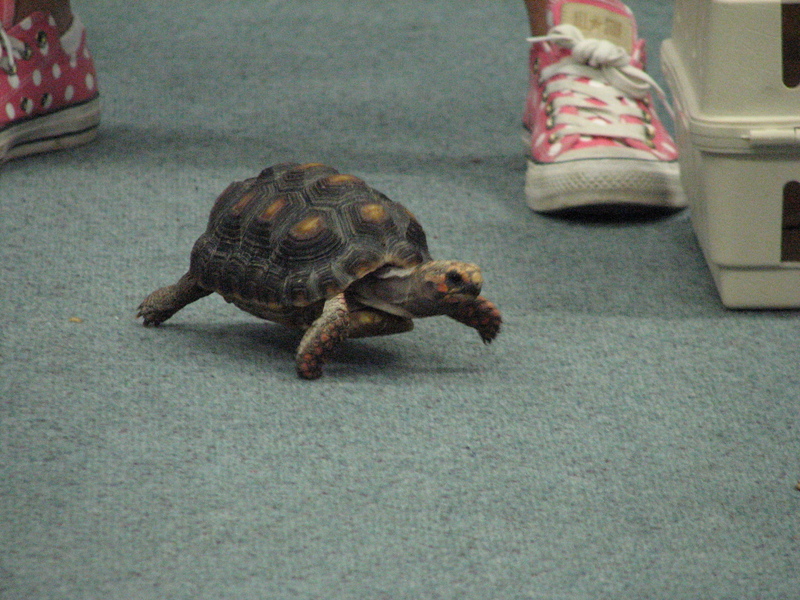 And a cute little tortoise who boogied pretty quickly around the room in an attempt to snag any bits of apple that the other animals had dropped on the floor. 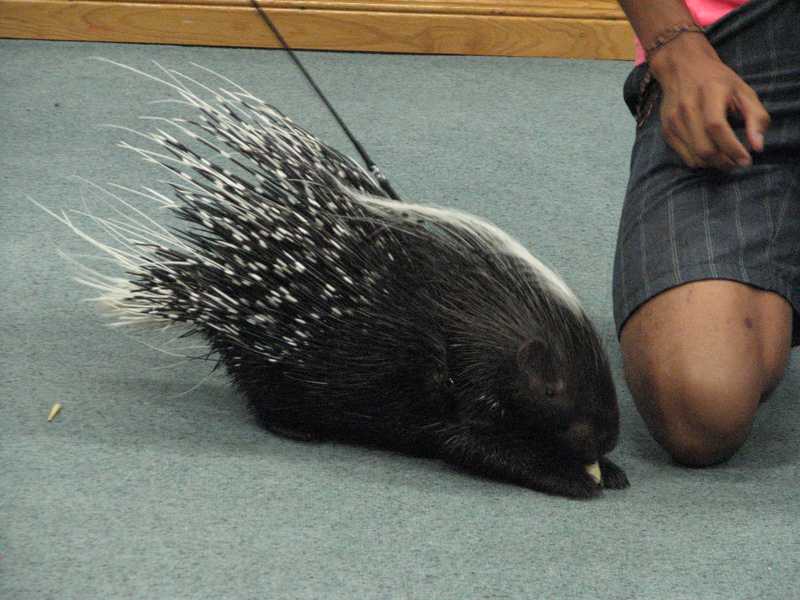 There was a super cool porcupine, too, named Velcro, I think? So freaking cute. Little prickle face. There were also a pair of absolutely stunning and impressive birds. 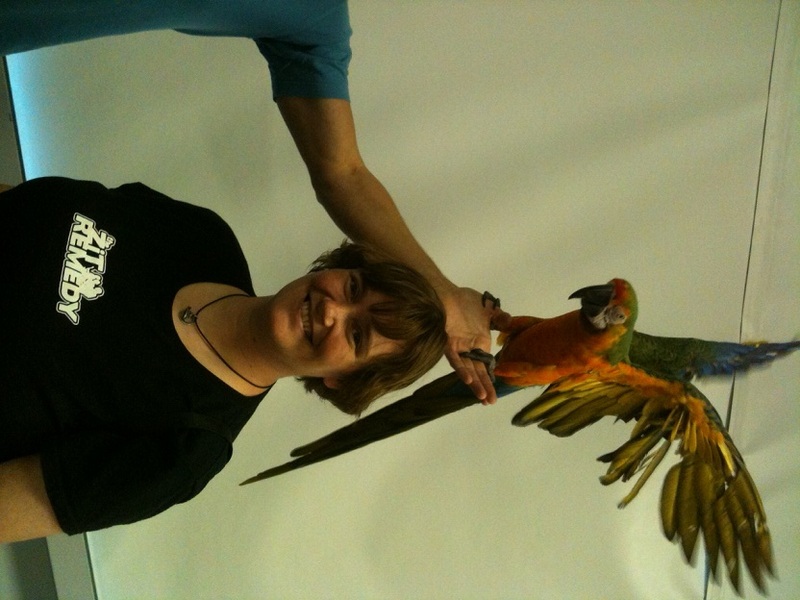 Zoe, a Catalina Macaw, managed to show us her Big Bird pose a few times, and then did it over and over while we everyone posed with her. She also laughed a few times, said ‘hello’, waved at people, and I think muttered a few things under her breath that I didn’t quite catch. So very pretty! 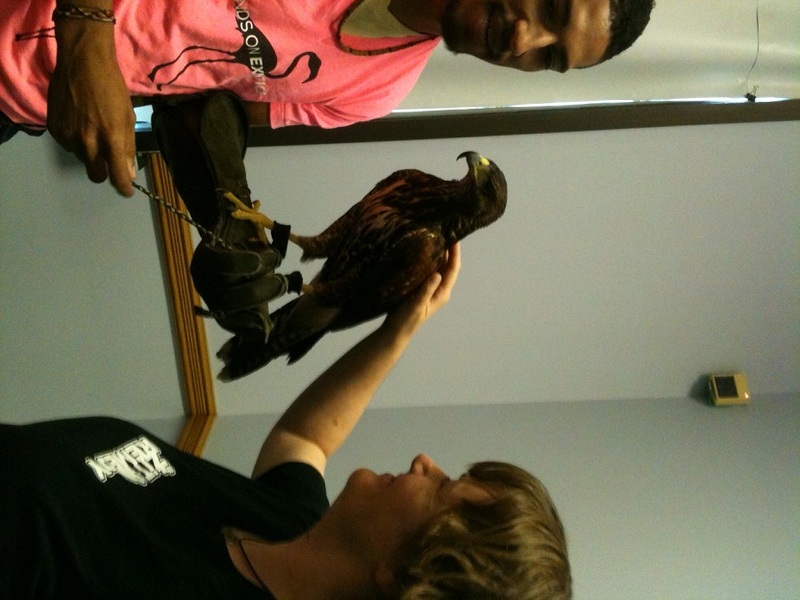 We also got to meet Broomhilda, a gorgeous bird of prey that I unfortunately can’t remember the exact name of. She surveyed the room with the kind of regal demeanor that lets you know messing with her would be a bad idea, no matter how big and tough you think you are. 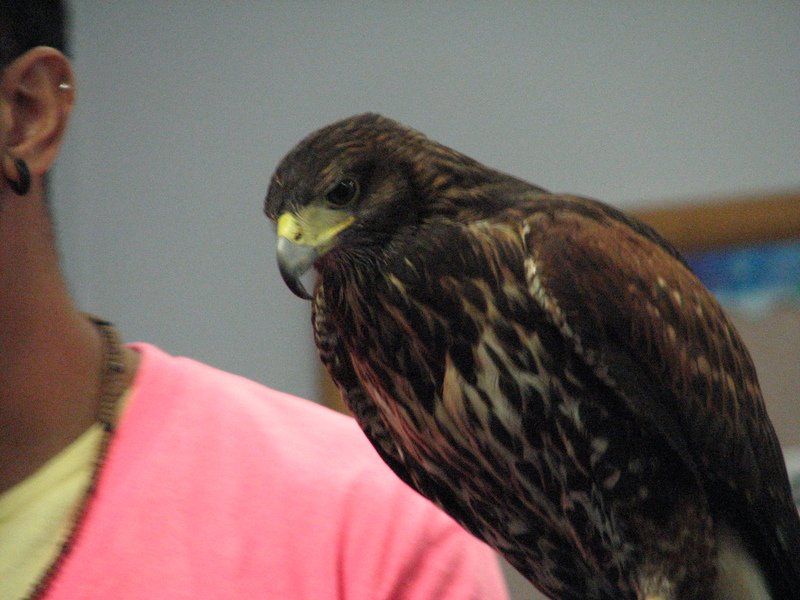 And she let us pet her back feathers from her gloved perch, which I appreciated more than I can express. Another dream, getting to be close to such a gorgeous creature. 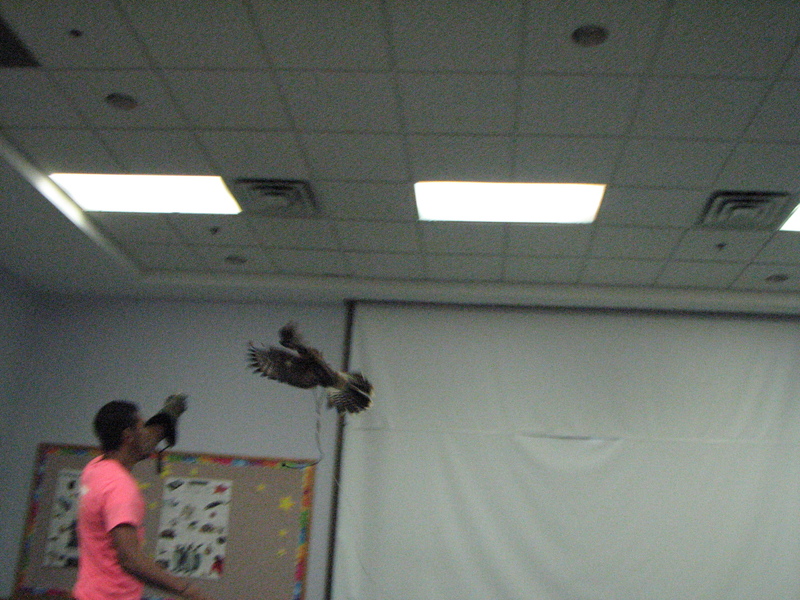 I’ve been pretty fascinated with birds of prey since I was a little kid, so this was very cool for me! In almost no time, we’d arrived near the end of the presentation, and my face hurt from smiling and laughing so much. Suddenly, though, an announcement was made: There was one more animal left to arrive! He was stuck in traffic and would be a bit late, so we’d have a closer look at a few of the animals that had previously been brought out in the meantime. I started to get excited. When we were given the clue that he looked “a bit like a monkey but he’s not one”, I about lost my mind. 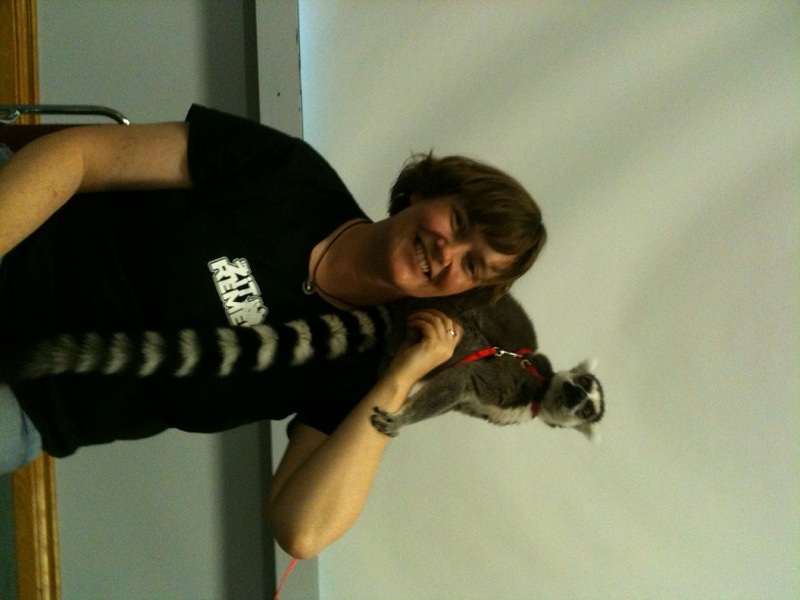 And that’s when Julian the ring-tailed lemur entered the room on co-owner Del’s shoulder, wearing a leash and happiness (or maybe that part was just me)! Yay! We decided to let the kids go first…and pretty much everyone else…so that we could almost take our time posing with Julian in our laps. There were no blueberries left, but he seemed pretty happy with the Ruffles substitute, and munched away contentedly after he’d had the chance to jump around a little bit first. 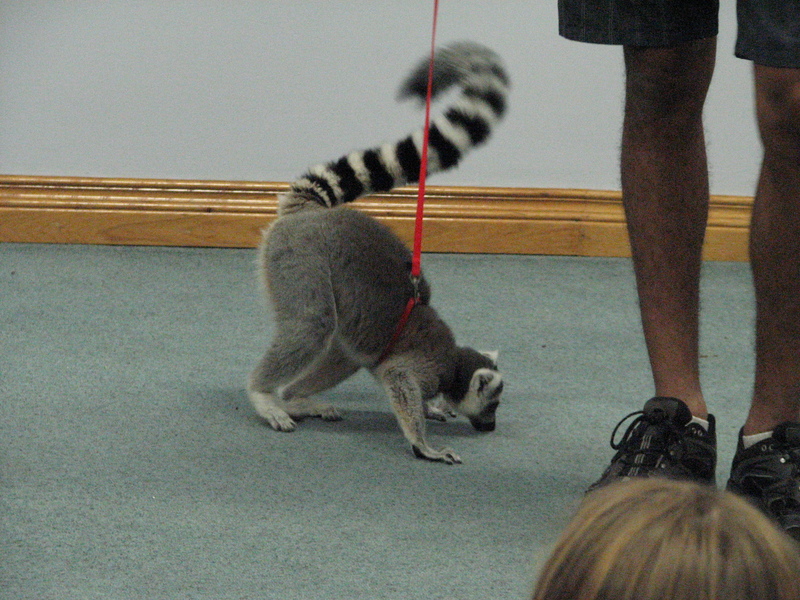 Oh, how I love lemurs! I think Julian ended up perched on my shoulder instead of my lap for our time together, but I didn’t mind. I listened to him crunch his chips and reached up one arm to pet him with, as he was holding on to the other one for balance. What a joy that little fool is! So very soft and gentle, alert and goofy. I was instantly in love, naturally, but I’d already been filled up with adoration for all of the other critters I’d met that afternoon. I’d already had an unbelievable time with the Hands On Exotics crew, even without any lemurs, so Julian’s arrival really put it all over the top for me, to say the least! When it was all over, I slipped Kevin our card to give to Seth, as my hope is that we’ll be able to do more with them in the future to help spread the word about the work they are doing in terms of educating the public about some of the species we know so little about, and would never have the chance to see up close and personal like this. In the meantime, though, make sure you check out their website here, and follow them on Facebook and Twitter to find out what’s coming up!